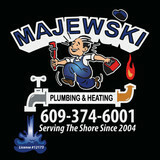 In Business Since: 2004 Majewski Plumbing and Heating, LLC is there when you need us, ready to take care of any problem that you may have with your plumbing systems and heating systems. We know your time is valuable. That is why when you call, we will arrive when you need us with a skilled service technician ready to get to work. Call today! Complete 24/7 Plumbing Service and Emergency Plumbing. Complete Design/Build Service, Building and Renovation, Custom Azek and Siding Work, Bathroom and Kitchen Renovations, Decks and Railings, Custom Built Outside Showers, Rinnai Tank-Less Water Heater "ACE" Service and Installation. We ARE: 25-Year New Jersey Experienced Residential & Commercial On Schedule On Budget Reputable and Easy to Reach! Master Plumbers specialize in installing and maintaining systems for drinking (potable) water, and then exit-routing waste water for fast, effective drainage. At Benjamin Franklin Plumbing, we value our customers and make their complete satisfaction our main priority. We believe that our customers' time is valuable and therefore pledge to offer prompt, reliable service that gets the job done. Our plumbing installation, maintenance, and repair services are backed by our built-in guarantee so that when customers call on us, they get accurate results in addition to peace of mind. Lenegan Plumbing and Heating are the leading HVAC contractors around NJ, USA. Visit our website to see what HVAC services our professionals have to offer! Frank Majewski has been in the plumbing business for 30+ years, we specialize in all phases of plumbing involving both new construction and renovations. We offer tankless water heaters, LeakSmart leak prevention, and plumbing winterizing services. We also pride ourselves on being at the forefront of our smart home services, including the merging of smart tech and plumbing. Dennis Lasassa Jr. Plumbing LLC. Harris Plumbing Heating Air Propane is family owned and operated since 1986. We enjoy providing same day service to our customers with a 100% satisfaction guarantee! A plumbing contractor handles the installation and repair of water, sewage and natural gas pipes throughout a home, as well as interior and exterior faucets and fixtures. Plumbing contractors are also trained to work with water mains, septic tanks, laundry appliances, water heaters, sump pumps and other plumbing and pipe systems. Because plumbing repair work is done largely behind walls and beneath floors, some plumbing companies can also patch or replace tile, stonework and other surfaces. Although some Stone Harbor plumbers are generalists, others specialize in specific areas; a 24 hour emergency plumber will handle urgent residential repairs, while others may be more skilled in remodeling, natural gas lines, overhead sprinkler systems and more. Find a local Stone Harbor plumber on Houzz. Narrow your search in the Professionals section of the website to plumbing contractors in Stone Harbor, NJ. You may also look through photos of Stone Harbor, NJ projects to find a licensed plumber who has worked on a project similar to yours. Here are some related professionals and vendors to complement the work of plumbers: General Contractors, Septic Tanks & Systems, Kitchen & Bath Designers, Kitchen & Bath Remodelers.